iChart Project Monitor - NexSens Technology Inc. The Project Monitor allows for immediate notification of system failures via email. To use it, make sure an SMTP email server is setup by clicking Edit | Preferences. To access the Project Monitor, click Project | Project Monitor in a current iChart project file. The System Monitor window will appear. Select the Status tab to set the schedule for emailing iChart project status information. Enter the Email addresses to receive the alerts, set the Schedule and click OK. The Status emails sent will include information such as which devices are enabled or disabled, if iChart is currently closing or if auto-interrogation is on or off. 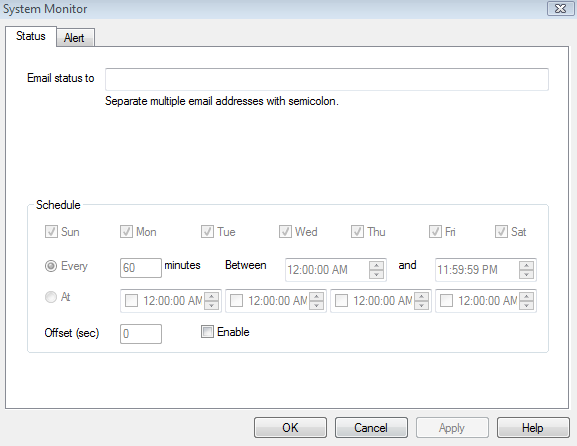 Select the Alert tab to set a schedule for alert emails. 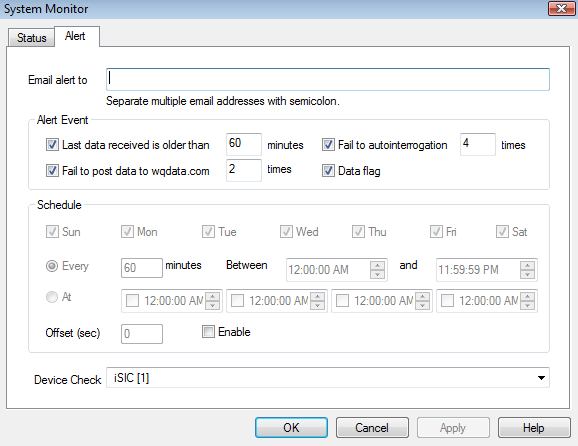 In the Alert tab, set Alert Events, a Schedule and select the iSIC to be monitored in Device Check. Click OK. Alert tab available conditions include auto-interrogation failure, out-of-date data, failure to post data online and error codes reported in the data (such as missing or out-of-range values).